As if the hike up to Codfish point the day before wasn't thrilling enough for one weekend, the following morning, we finally made it to Fawn's Leap. This is one of the most painted and sketched waterfalls of the Hudson River School artists. It lies deep in a ravine along Kaaterskill Creek. The steep slopes on either side make access challenging. Then just for good measure, you have to pick your way across rocks in the rushing water to get to a point where you can see the whole waterfall. Fortunately for me, there was a downed tree trunk there, supported by a rock. 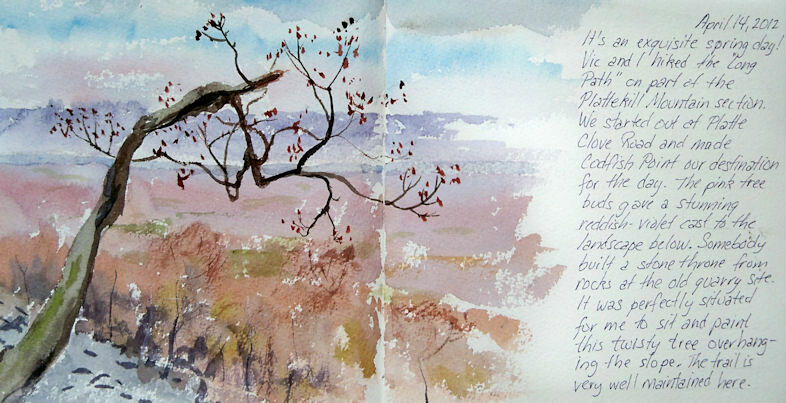 That's where I sat, mid-stream, to do this little watercolor sketch. 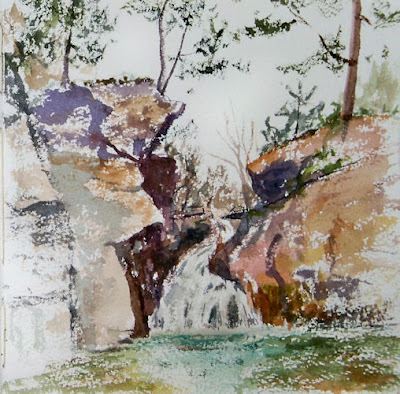 Even though the water levels are pretty low this spring, while I was painting with my legs dangling down from the suspended tree trunk, one of my boots got soaked when I wasn't paying attention. I was sure I was going to lose a few brushes in the process, but seemed to arrive back home with all my gear (and myself) intact! Back in December, I placed an order with Small Oak Press for two custom sketchbooks --- one to be made out of Arches Bright White Rough 140 pound paper, and the other of Stonehenge white. They were my holiday gift to myself, and they arrived last week. I took the Arches book out hiking over the weekend. I expected it to be difficult to dive into the first page spread of an $80 sketchbook, but when the time came, I found it surprisingly easy to let it happen. 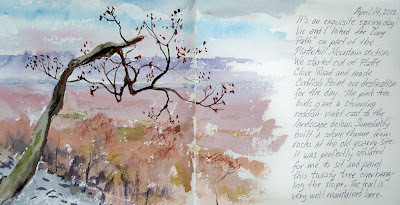 Perhaps I felt I deserved to paint on great rag paper after hiking two and a half miles uphill! We hiked up Plattekill Mountain to Codfish Point. There was a stone throne that somebody made in an old quarry up there, facing Hudson Valley views that span 60 miles of the Hudson River off in the distance. It was the perfect spot for a weary painter to take a break, have lunch, and enjoy the vista. 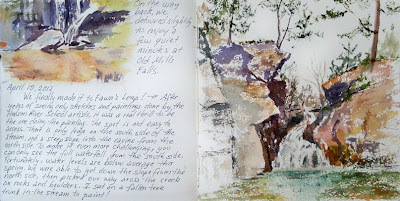 I pulled out my watercolors while my husband went off to take some photos and explore down the trail for a few minutes. 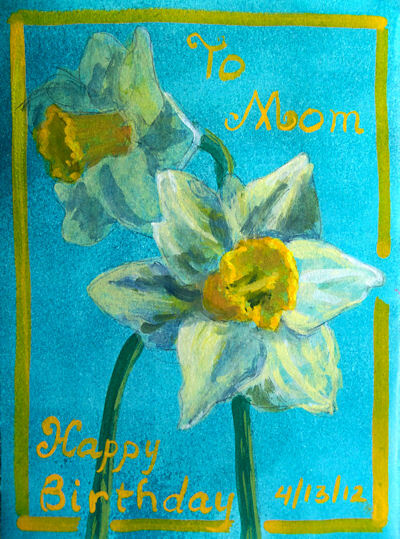 This is another card I made for my mom a few weeks ago, but I never got around to adjusting and posting the photo. 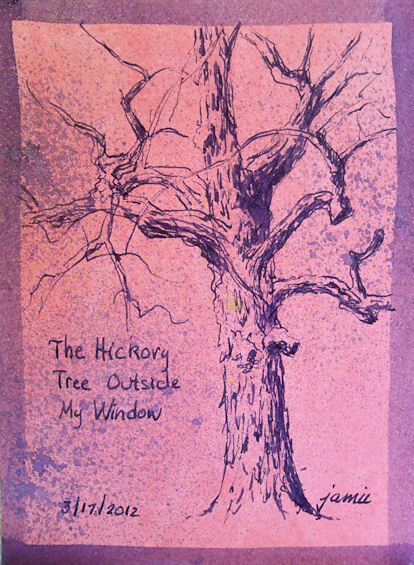 Sometimes when it's just too cold, as it was on this chilly morning in mid-March, I'd sketch something from my window. 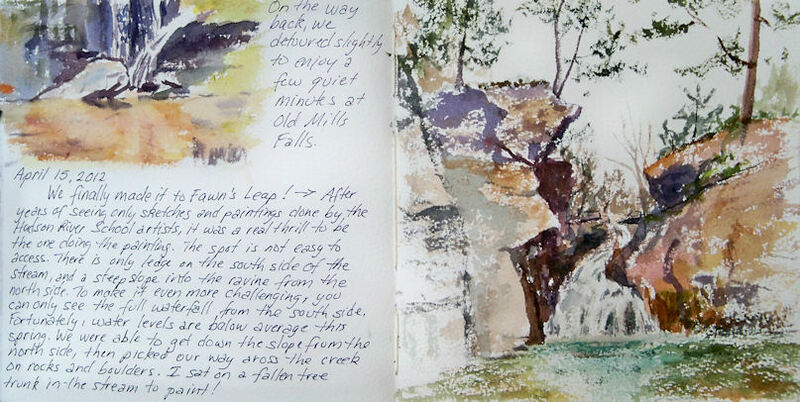 In this case, I selected a favorite tree and my awesome favorite TWSBI pen, filled with Noodler's La Reine Mauve ink. It's a great ink for sketching cards because it is totally waterproof. If the envelope happens to get wet on the way to its destination, the sketch will survive intact, and the writing inside the card too! The card was made with Strathmore Aquarius II paper, and painted with diluted Golden Fluid Acrylics. I've been sketching quite a bit lately, but haven't had enough time at the computer to get all the images photographed and posted! Today is my Mom's birthday. A few days ago, I went out and picked daffodils, and painted them in gouache on a card I made for her with some Aquarius II paper. It's a tri-fold, primed with diluted acrylic paint and some sprayed iridescent paints. If you haven't read the recent post by Robert Genn about the importance of sketches and small studies, it's a great read, as well as a reminder of the important role this kind of work plays in the creative process and artistic development.